Historical weather data were used to divide the northern United States into five climatic zones based on the number of hours below 15.6°C (60°F), which is the approximate lower developmental threshold for the maize weevil, Sitophilus zeamais Motschulsky, during a calendar year. A model for population growth and development of the maize weevil, which is integrated with a bin-cooling model, was used to predict temperature, relative humidity, number of larvae, and number of adults in unaerated and aerated corn during 1 yr of storage. In all zones, predicted temperature profiles in unaerated corn indicate that it would take 2-3 mo for grain temperatures to reach the developmental threshold of 15.6°C, whereas aeration would rapidly lower grain temperatures to this temperature. In unaerated and aerated corn, predicted relative humidity would gradually decline with temperature. Larval populations in unaerated corn were predicted to increase during autumn, although numbers would decrease as the climatic zones progressed northward. In all zones, the predicted number of larvae in unaerated corn would decline through winter and spring of the following year because temperatures would be well below the developmental threshold of 15.6°C, and it would increase beginning in midsummer when temperatures increase. Except for corn stored in the southernmost zone, adult populations were not predicted to increase during autumn in unaerated corn because temperatures would not be warm enough to complete a generation. However, predicted adult populations in unaerated corn stored in all zones would begin to increase in August and September of the following year when larvae already present in the kernels complete development. Predicted populations of larvae in aerated corn stored in all but the southernmost zones would decline during autumn because of the rapid cooling provided by aeration, and in each zone the total number at the end of the calendar year would be about two orders of magnitude lower than in unaerated corn. Aeration would reduce the number of adults to about 1.5-2.0 orders of magnitude less than the numbers predicted for unaerated corn. Advancing the storage date by 1 or 2 wk would have little effect on predicted populations of larvae or adults in unaerated or aerated corn stored in the three northernmost zones. 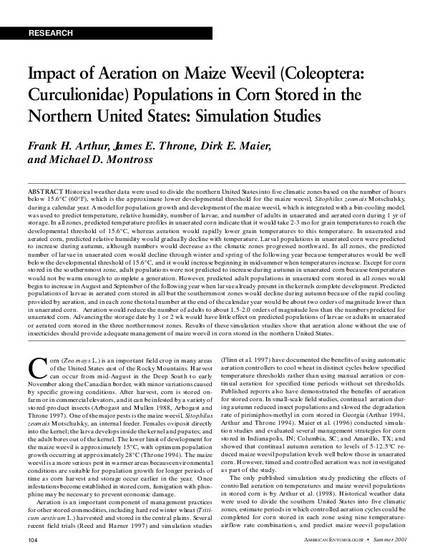 Results of these simulation studies show that aeration alone without the use of insecticides should provide adequate management of maize weevil in corn stored in the northern United States.